The Ibanez Universe guitar is so cool! it has a triangle on the body which has an eye and three sevens on it. It also has pyramids on the neck and it has seven strings. It was designed by STEVE VAI! 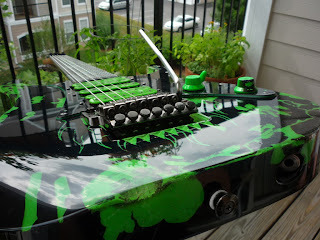 This now-legendary Ibanez Universe created quite the stir on Jemsite when it was first posted last year. Now it’s for sale. Many see it as a hideous disfigurement of a relatively rare and collectable guitar. Others think it’s pretty cool. What do you think about it? Post your comments here. You can see the original Jemsite thread here, but the original poster has removed all their posts and photos. Still, reading this thread will at least give you an idea of the kind of reactions you can expect if you take this guitar out in public! We started this custom Universe project by purchasing three beat-up player UV7BK’s, we sound tested necks, pickups and bodies to find the best combination that gave the sound Ben was looking for. The body he chose had a huge chunk out of the bottom horn, deep into the wood, this is what inspired the creating of the 3D HULK finish. The HULK UV project developed as Inspiration came along the path of trying idea’s to create an original character within a Universe 7 string. During this process, we posted step by step pics on Jemsite.com. The intensity of the feedback was one of the elements that drove Ben to drive this guitar through a long project of enduring the Blood, Sweat & Tears to create what the guitar is today. CLICK HERE to see the Hulk on eBay.